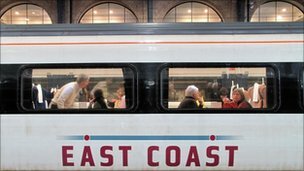 East Coast Rail is celebrating a successful start to its new timetable and first class service. The rail operator has seen first class journeys increase by almost a third after the new timetable was launched in May 2011. Compared to data from 2010, the four weeks leading up to 23 July 2011 saw 173,000 first class passenger journeys, a rise of 29%. It’s the biggest rise seen on the East Coast line in the last five years. The new timetable added 117 extra rail services a week with more than 3 million more passenger seats to the timetable. Direct return services to and from Harrogate were reintroduced for the first time in 20 years, and a new daily service between London and Lincoln was also started. As well as the new timetable, East Coast Rail also upped its first class service, including free food and drinks, with hot meals on weekday morning and evening trains and a special ‘quiet coach’. The new improvements certainly seem to be paying off. As well as the increase in first class customers, East Coast’s share of the London to Edinburgh rail market rose by 3% in June 2011 compared with June 2010. Get the best savings on your rail trip with National Railcards. You’ll get discounts of 1/3 OFF train fares. What are you waiting for? Grab one today and get money off rail fares in Britain. It seems that given the right timetables and service, more and more people are making the switch to rail, given rising petrol prices and the opportunity to avoid motorway hold-ups and lengthy check-in waits for domestic air travel. It’s a trend we’ve seen for a while now, as previously reported on Green Abode. And anything that gets travellers out of their cars and onto the trains can only be a good thing.